As roof repair professionals who serve the Alliston, ON area, we are known for the quality of our service and the quality of our workmanship. From moisture accumulation to sudden windstorms, there are many different things that can damage and weaken your roof’s structure as time passes. Although it’s natural for your roof to deteriorate as it ages, it’s still essential for you to make repairing it a priority. Otherwise, you could threaten your safety and allow expensive and extensive problems to develop that could have been prevented. 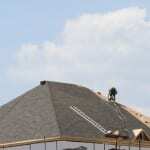 If your roof could use some work, our team at Slippery Slope Roofing is here to help. As roof repair professionals who serve the Alliston, Ontario area, we are known for the quality of our service and the quality of our workmanship. Whether you need to have a few shingles replaced or your roof is reaching the end of its lifespan, we guarantee we can repair your roof with excellence. If you aren’t sure whether you need roof repair, we recommend calling us for help if your roof dips or sags in certain spots, water leaks into your home whenever it rains, or small granules from your shingles keep showing up in your gutters. It’s also a good idea to have us come and take a look at your roof if your heating and cooling bills have gone up drastically or if your roof is missing shingles in certain spots. Since we are highly experienced, qualified, and committed to customer satisfaction, we are the ones to turn to for all of your roof repair needs. Contact us at Slippery Slope Roofing today for more information about our proven processes and what sets our team apart.